How the Hell Was I Supposed to Figure That Out?! 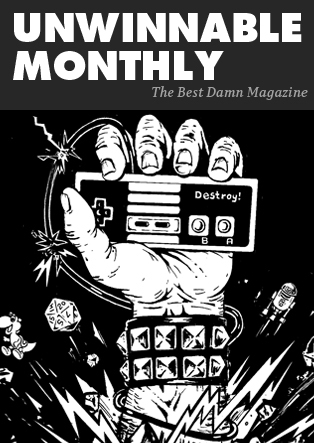 Three months ago, Antichamber released as an almost microcosmic exhibit of everything wonderful and wrong about puzzles. It accomplished so much by doing just one simple thing: forcing us to think laterally, not logically. For some reason, not a lot of people are talking about this. Most of this first-person puzzler takes place in an impossible fourth-dimensional environment where X and Y intersect each other like spatial cross-hatches. Chunks of map teleport in and out when you’re not looking, corridors lead into infinitely-looping circular hallways and staircases don’t always lead up or down. The density of clever map-editor tricks in this game gives it a sinister tone – there’s always a cruel, unpredictable trap around the next corner. The soul of every puzzle is a careful balancing act between lateral and logical thinking. What’s brilliant about these non-Euclidean navigational puzzles is that you have to try solutions that theoretically shouldn’t work, but do. There’s a series of never-ending staircases than can only be escaped by simply turning around and walking away. There’s an elevator shaft whose first few floors are always different depending on whether you’re traveling up or down it. There’s one puzzle that traps you in a blank, featureless four-walled room until you look in a certain direction and backpedal, suddenly finding yourself walking backwards outside of that room into another one. These puzzles don’t make sense. The way the game handles geometry and physics doesn’t make sense, either. It all takes place in an impossible space, so in order to complete it your thinking has to start making less sense as well. That kind of thinking, the kind that wants to solve problems in an unorthodox and unreliable way, is lateral thinking. It stands at the opposite end of logical thinking, which has you solving problems via math and method. “Lateral thinking” is a term coined in the late ’60s by physician Edward de Bono. It’s the process of solving problems through indirect, creative and sometimes illogical methods. There are entire volumes of lateral thinking puzzles whose solutions are always something unexpected but reasonable. It’s a challenging thought process that requires one to overcome old habits and think without established preconceptions. To illustrate the concept, puzzles like these require you to think flexibly (i.e., laterally.) 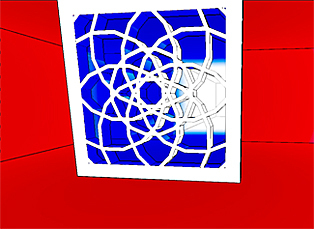 Antichamber does this; it requires you to think laterally about spatial relations. You can’t use common sense to solve its puzzles; you have to constantly adapt to unpredictable new rules and think laterally. Excessive reliance on lateral thinking is something that’s usually discouraged for videogame puzzles. After all, games themselves are such systematic things, full of meticulously designed inputs and outputs, heuristic circles of delicate feedback loops and carefully-crafted algorithms. Throwing a puzzle at the player that can’t be solved logically is a problematic thing to do, and a tacky reliance on irrational puzzles nearly killed off the entire genre of point-and-click adventures from the ’90s. But Antichamber is a fantastic example of a game where lateral thinking works. Consider the setting: a blank white slate of amorphous, featureless puzzle rooms. They’re designed to be modular, with no textures, just colors. It visually suggests that the architecture of these rooms can change at any time, and the game carefully trains you to prepare for the unexpected. It ironically creates an environment where thinking laterally is the most logical thing to do. But this brilliant spark of alien level design doesn’t last. Later challenges devolve into gamey block puzzles that require more regular ol’ logical thinking. One moment, the game will have you methodically collecting blocks, counting them one by one to make sure there are enough to fit into however many switches need to be pressed in the next room over. They’ll activate whatever series of mechanisms open the next locked door; they’ll build you a bridge over a deep chasm. These are just a few examples of how your progress is periodically stopped by very causal machines. One moment you’re tracking which switches activate which doors, which cubes you can collect and which ones you can’t. Then two minutes later you’re walking over thin air and through false walls to figure out how the shape of that next room changes with your movement. It’s a psychological tug-of-war that screws with the pacing of the whole game. Quickly switching from a an orderly logical mindset over to a disorderly lateral one is a jarring experience, and after so many of these transitions Antichamber becomes mentally exhausting. But this is the same problem that every other puzzle game has to manage: how do you depict illogical puzzles logically? Game designers carefully engineer their products to motivate the player to progress. More often than not, that motivation is a hedonistic feeling of reward, satisfaction or victory. For a puzzle game, it’s the “aha!” moment: the instant that you figure out what you need to do before putting that plan into action. As a result, players feel smart. Feeling smart makes players feel good. The problem with quantifying a reliable formula for making players feel good is that games are steeped in providing players with the illusion of choice. None of the illusory choices the player makes are grounded in the real world, nor are they even reliably cogent in the canon of a game. With no consistent rules or logic to give games familiarity, we end up doing a good deal of lateral thinking in every game. We familiarize ourselves with their fantastical rules and gradually learn what patterns ground their logic. More inconsistent patterns lead to a more illogical logic, which leads to more frustrating puzzles. In Sam and Max: Episode 1, you fool a mouse into thinking that cheddar cheese is Swiss by shooting a burst of magnum rounds into it. In Grim Fandango, you scare pigeons off a rooftop by tricking them into popping a Robert Frost-shaped balloon hidden in a bowl of breadcrumbs. Those puzzles aren’t logically realistic – they’re solved by means that are more destructive than they are rational! You know that moment where you ALT-tab out of these old-school adventure games in disgust? You shamefully Google the solution before shouting, “How the hell was I supposed to figure that out? !” Maybe it’s just me, or maybe they’re too lateral. 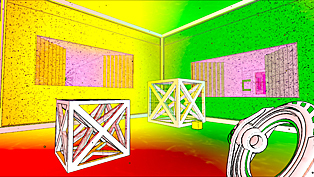 But Antichamber’s puzzles are far weirder than the Byzantine challenges of the old LucasArts point-and-clickers, yet it never once drove me to Google. Think of a completely abstract, two-dimensional puzzle game like Tetris or Bejeweled, where you clear a board of objects by sliding even more objects onto the board. That doesn’t make a lick of sense, but you quickly learn to think logically about the rules governing its lateral presentation. A torrential avalanche of “aha!” moments is the end result. The soul of every puzzle is a careful balancing act between lateral and logical thinking. Antichamber’s eight hours of spatial riddles lick both parts of your brain, and it at least got me thinking much farther outside the box than any game before it. For that, it deserves recognition. Its weird puzzles were grounded in the constant insistence that its solutions will always be about navigation and blocks – nothing else. What was remarkable was that this actually worked. At last, we have lateral thinking puzzles that are solved elegantly! Antichamber has you easily doing the impossible, in ways that we never thought possible before. It’s a rough product, but a truly groundbreaking one. It’s a shame that people stopped talking about it so soon. In middle school, George Weidman had a math teacher who made him do lateral thinking puzzles for homework. He never forgave her. His vengeful spirit lives on at Twitter @superbunnyhop.